In light of recent holidays celebrating the hard work, sweat, and tears of parental figures, it seems especially fitting to talk about Sue Atkins and her new addition to the App Store: Parenting Made Easy. Through this iPhone app, the parenting expert (founder of Positive Parents, as well as broadcaster, speaker, and author of the best-selling Raising Happy Children for Dummies) strives to give parents the right tools to bring up happy, well-behaved children. 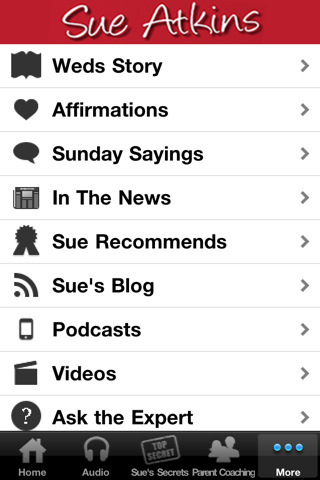 In the app, Sue Atkins offers advice through videos, podcasts, and stories, among other mediums (be aware that you need an internet connection in order to access some features of this app). The second tab gives you five tracks from her best-selling CD, with an option to order the entire thing (12 tracks in all). Sue’s Secrets, found on the third tab, reveals her top 10 tidbits, part of a companion piece to the CD; the entirety can, of course, be purchased along with the CD. Each week, Sue will post a question parents can ask themselves, usually providing some sort of background experience to aid the user in reflecting on their own techniques. And if this weren’t enough, the last tab is chock full of useful links out: from wedding stories to blog posts to videos, there are many tidbits to be mined for your own use. I have no children of my own, so I really can’t review this app honestly from a “targeted audience” sort of view, but I can tell you that as a near-former child, a lot of the advice I listened to/read in Ms. Atkins’ app made sense to me. There was a lot of nodding going on while I went through her app: “why yes, I would appreciate this sort of approach” and “those would make me ‘shut down'” were a couple of the responses I had. The hawking of her products was a little off-putting, since this app is already costing you $4.99, but as it’s probably her bread and butter, I guess you can’t really blame her for it. As it is, only about half of her best-selling product is represented in the app (as far as I can figure), but there is plenty of online material to look at as well, at no further costs. If you have trouble reading large amounts of texts on a handheld device, I would recommend going directly to her site on a computer instead of scrolling through all her posts, but it is handy to have them all collected in one location. It’s not the prettiest app ever designed, but it does its job helping parents do their most important job. AppSafari review of Sue Atkins’ Parenting Made Easy – The Secrets to Well-Behaved Kids was written by Julie Guan on June 22nd, 2011 and categorized under App Store, Education. Page viewed 3813 times, 1 so far today. Need help on using these apps? Please read the Help Page.